Facebook is the new gaming frontier, with even large companies like Maxis now trying to tap into the platform's millions of users. Maxis recently announced the release of its new Facebook game: Spore Islands. Maxis is a pretty big name, indicating that Facebook is getting some attention from the heavy hitters. I'm a strong believer in Facebook as a viable gaming platform, which unfortunately has not yet delivered a truly compelling core experience. There are some fun diversions to look at, and to waste one's life clicking on, but nothing really all that great. 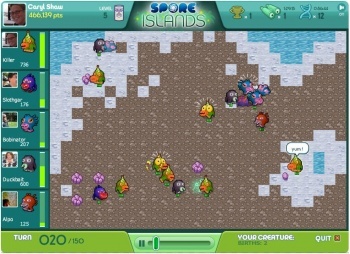 As can be guessed from the name, Spore Islands allows players to create their own creature from various sets of bodies, mouths, legs, and eyes. Each of these parts has three associated statistics that will change a creature's ability to reproduce, find food, fight, and the like. Once a creature is designed, the player chooses a type of island to inhabit and sets the creature loose upon it. Other creatures, designed by either your friends or designated as "wild," will wander, fight each other, and forage for food during island "observations," through which the player will gain points by creating a creature that performs the best. For a game from a semi-casual franchise being placed on a casual platform, Spore Islands feels very sim-ish. Players can constantly evolve their creature's stats to find the best balance to try to outperform the other creatures on the island. The game is monetized through micro-transactions that allow players to purchase in-game currency, called DNA, which is used to upgrade creature abilities or for cosmetic enhancements such as pirate hats and different creature animations. I love the idea behind Spore Islands, but I'm just not sure if it's fun or not. The gameplay consists of creating a creature, and then watching it on an island for about a minute or so. The observation portion of the game can even be skipped entirely just to find out the results. The game is in beta right now, so it might just need some more time to hit its stride. Check it out and see what you think at Spore Islands' Facebook page. The only game I've found so far on Facebook that I consider to be worth my time is Tetris, and I believe I shall continue to entertain that notion until the Civilization Network is released. Still, is Spore is adequately popular among my friends, and it shows promise of being a timewaster more worthwhile than Wipeout at the moment, then there's all the more chance I may renew my interest in the now apparent Spore franchise. this spore game is playable but no idea how long it will keep my interest for. I'll probably try it, but it looks like it will get boring after about a week. I've been playing this the last couple of days and it's lacking something. It needs some kind of levelling up system otherwise there's not really anything to do once you've got your island set up and your creature best suited to beat the other creatures. In a way it reminds me of Pokemon, but dumbed down. Only game in facebook I thought worth playing was Poker if it wasn't for kamikaze players. So the Facebook Spore game is only the cell stage? That's the most boring part of the game Spore! They should have made a space exploration type game where other players can visit your planet and try to steal your resources/conquer you. Oh well, I might give this game a shot.